I thought I had seen it all until stumbling upon SPONGEABLES. This is the most fun way to shower for kids of all ages, and I’m completely hooked. Children will be asking you if they can take a shower rather than having to cajole them into doing so, and adults will find showering to be a whole new experience. 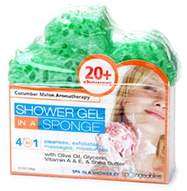 This is a shower gel in a sponge and gives 20+ showers. You get to exfoliate, moisturize, massage, and wash with the sponge that contains time-released gel. Simply squeeze the sponge in warm water and wash away with the creamy bubbles. When you are finished, squeeze again to get rid of excess water and it’s ready for your next shower. I’ve been using White Rose but check out any scent this company puts out because this is the most magical sponge you’ll ever own. $10-$45 @ ulta.com.